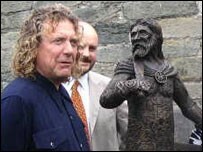 A rock legend met a Welsh legend when Led Zeppelin frontman Robert Plant was guest of honour at the unveiling of a statue of 15th century rebel leader Owain Glyndwr. Plant donated money towards a bronze sculpture of the Welsh prince. He was at Pennal church, near Machynlleth, when the tribute was revealed at a ceremony on Saturday. The singer's interest in Celtic history spans decades. But Plant, who owns a farmhouse in the area, wanted his visit to be low key. 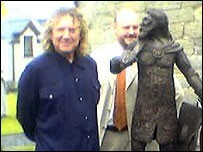 His appearance was only made public three days after the unveiling of the Glyndwr bronze. Plant became involved in the project through word of mouth. He is part of an Owain Glyndwr network and regularly attends meetings throughout Wales about the prince. And he also supports heritage projects. The rock star is understood to have helped fund a slate carving of Glyndwr's coat of arms at the Celtica museum in Machynlleth. Other stars donated cash towards the statue too, including Hollywood actress Julia Ormond, whose grandmother was from Pennal. Former Wales rugby great Ray Gravel also contributed. Rev Geraint ap Iorwerth, rector of St Peter ad Vincula Church in Pennal, said: "Robert Plant, Julia Ormond and Ray Gravell all generously donated towards the statue. "I was glad that some of the statue's patrons, such as Robert and artist Aneurin Jones, could attend the unveiling on Saturday. "How many other people who've been dead for 600 years could draw together a rock star, a Hollywood actress, a rugby great and one of Wales' greatest artists as patrons of this project?" He added: "Julia Ormond's father's family are said to be direct descendants of Owain Glyndwr's sister and Julia also supported the statue appeal. "Julia's grandmother was from Pennal and was secretary of the Parochial Church Council in the 1930s. "Unfortunately, Julia couldn't be at Saturday's unveiling." In rock folklore, it is reputed that Plant and songwriting partner Jimmy Page penned the lyrics to Led Zeppelin's famous track, Stairway to Heaven, at his Powys home. The rock star was unavailable for comment about his role in the statue project because of commitments overseas. At a cost of £5,500, the bronze sculpture stands in the garden at St Peter ad Vincula Church. The garden was also landscaped and cost £35,000. It was funded by the Welsh assembly, Gwynedd Council, and Snowdonia National Park Sustainability Fund. It is in the style of a mediaeval monastic herb garden. "The statue by Dave Haynes, Bethesda, is the first ever bronze statue of Owain Glyndwr," added Rev ap Iorwerth. Slate plaques to the Princes of Gwynedd's golden age of Owain Lawgoch - the last prince of the Royal House of Gwynedd, Glyndwr's clerical supporters of 1406, and Marged Glyndwr and her sons and daughters were also unveiled on Saturday. St Peter Ad Vincula's (St Peter in Chains) sister church is the parish church of the Tower of London. Founded in the 6th century, the church is renowned for its association with Glyndwr, who visited Pennal in 1406. It was there he wrote the famous Pennal Letter to French King Charles IV calling for support for his rebellion. The letter was never answered, but remained in the French national archive. It is one of very few surviving examples of his handwriting and includes a copy of his seal. The bronze was cast by Castle Fine Arts in Llanrhaeadr-ym-Mochnant, Powys, the company which crafted a statue of John Lennon for the airport which bears his name in Liverpool.